Do you ever try something from a new/new to you brand and love it so much that you suddenly need everything else from the line? Because that was me with Milk Makeup. Born of the NYC/LA-based media company Milk, the line promises to be cool, eco-conscious, and perfect for the person on the go. 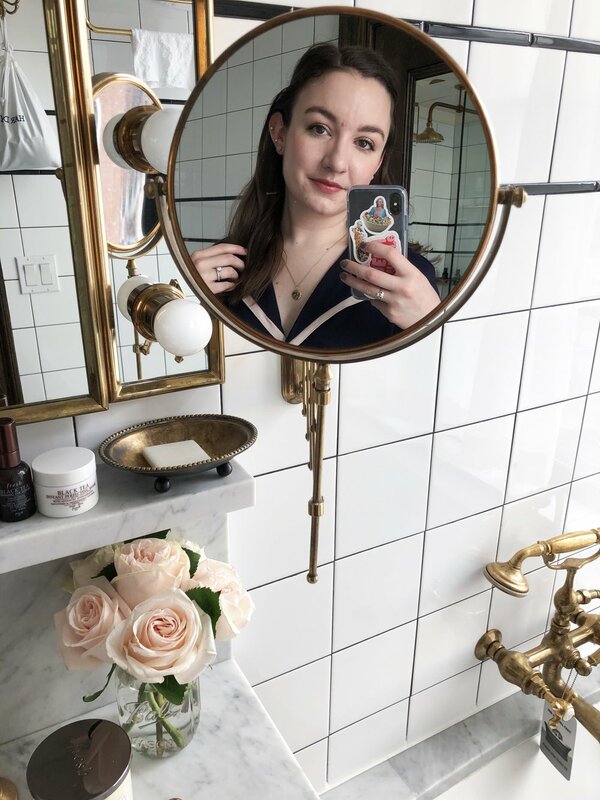 Being more and more in the mindset of "stay in bed as long as possible," lately, the "on-the-go" aspect really spoke to me - to me, "on-the-go" products mean "easy and quick to apply." Most of their products come in handy twist-up sticks that are definitely perfect for quick applications and touch-ups. The line is cruelty-free as a whole, and many of the products (they say 60% of them) are also vegan. I got the Matte Bronzer for my birthday at the beginning of the month, and after trying it once I knew it was love. I immediately picked up three more products in the Sephora VIB Sale the following week. Here's what I've been thinking so far. Matte Bronzer, 'Baked' | The one that started it all. I first saw this being used in an article on XoVain, and I knew immediately it was my kind of product. I've been more and more into bronzers lately, and I love me a cream product, especially when it comes in a stick. The Matte Bronzer in Baked is the absolute perfect shade for creating warmth in the skin (of which I have none), though it is not orange in the slightest. I love applying it in a "3" shape on the sides of my face and blending with either my fingers for the Real Techniques Expert Face Brush for a little bit of sculpting and bronzing in one. The formula is so creamy (it has "Milk Melt Technology" to melt on contact with body heat) and just melts into the skin, though I'm not worried about it melting off in the summertime. This was love at first swipe for me, so I of course added more to my collection. Highlighter, 'Lit' | I bet you're not surprised I bought the highlighter - they're my weakness. This has the same melting technology as the bronzer, so again, it's ultra creamy and blendable. It's a soft pale golden champagne shade that leaves the loveliest sheen on the skin. Needless to say, I'm hooked. I sweep this on the tops of my cheekbones, down my nose, and dab a little bit on my cupid's bow and on the inner corners of my eyes with my fingers. I can definitely see myself dabbing this on my collarbones too in the summertime if I'm feeling extra fancy. Lip + Cheek, 'Rally' | The third chubby stick-type product I've got is a color for the lips and cheeks - I picked Rally, which is a mauve shade (of course). The color payoff of this is more sheer than the bronzer, which I like because with my rosy complexion, I need to be careful about color on my cheeks. Just like the bronzer and highlighter, it blends beautifully into the skin. It also contains mango butter, peach nectar, and avocado oil for hydration - it doesn't feel greasy on the cheeks, but it's incredibly nourishing on the lips. I dab the stick on my cheeks and blend with fingers when I want to use it as blush, but I apply it to my lips using my fingers. I'd love to try the deeper berry shade ("Quickie") next. Ubame Mascara, 'Inked' | I was in the market for a new everyday mascara, and this one looked promising. I love that it comes in a squeezy tube, although I don't really know why it pleases me so much. I also really like the wand, a fiber brush composed into three balls (although the models in Milk Makeup's demo videos saying "It's got balls!" over and over is a little grating). It grips every lash and really helps lift them up. I get a really great curl and impressive length with this. Despite not being waterproof, the curl hangs around until the end of the day, too. I usually have to wear waterproof mascaras so they won't smudge on me, but this one doesn't cause any major issues. If I'm having a particularly oily eyelid day, I'll have to wipe away a few tiny smudges under my eyes in the afternoon, but that's it. I'm so impressed with this mascara, and it's one I'll definitely keep repurchasing to use on an everyday basis. Milk Makeup is available to from Sephora, Urban Outfitters, and the brand's website. Have you tried anything from Milk Makeup?